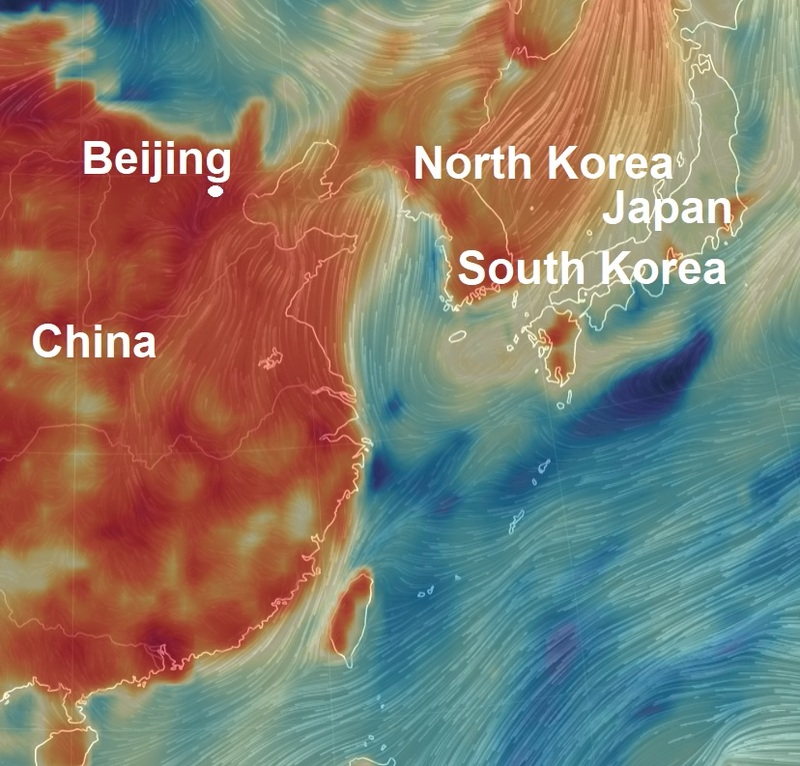 Earthwindmap showing incredible amounts of PM2.5 (in red) Particulates over China. Beijing's air quality index (AQI) soared to hazardous levels on Wednesday (Mar 28) morning as a sandstorm smothered the Chinese capital in dust after triggering an alert late on Tuesday from the National Meteorological Center (NMC). In a 'blue' warning, the lowest in China's four-tier alert system, the NMC advised citizens in northern parts of the capital, northern parts of the surrounding Hebei province and other regions to close doors and windows, wear scarves and dust masks and drive slowly due to poor visibility. The alert would remain in place until 1200 GMT (8pm Singapore time) on Wednesday, the agency said. The AQI reading for Beijing provided by the US State Department, based on the concentration of cancer-causing breathable particles known as PM2.5, was 244 as of 0153 GMT, rated as "very unhealthy". China's own official AQI reading for the city - calculated using measurements of six different pollutants including PM2.5 - was 999, rated as "hazardous". Readings provided by some mobile phone applications gave figures as high as 2000. Sandstorms register on the index as larger particles known as PM10. China normally blames Mongolia's Gobi desert for its annual sandstorms. Delegates from China's arid, desertified Gansu region said in a proposal to China's parliament earlier this month that more than half of the dust storms that descend on China each year come from abroad, mainly from southern Mongolia. Beijing has been planting millions of trees along its border in order to block out sandstorms, part of a project known as the "Great Green Wall". The notoriously polluted Chinese capital was a top performer in terms of smog reduction from October to February, according to Beijing's Ministry of Ecology and Environment. But it was one of 34 cities in northern China to issue orange pollution alerts over the weekend, as industrial activity starts to ramp up again after winter curbs.